This box contains a Republique of France Naval Attack Flotilla. Leading this formation into battle is the mighty La Rochelle Class Battleship. Fitted with advanced technology - a fearsome experimental heat lance and the extraordinary Sautiller Generator - this ship re-affirms the Republique’s place as one of the foremost naval powers in the world. 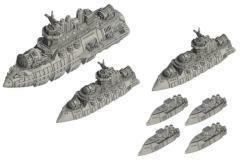 Supported by Cherbourg Class Battle Cruisers, each mounting three deadly heat lances, and Requin Class Assault Corvettes packed with elite French marines this fleet charges into battle like the Cuirassiers of the Sea.